Before learning how to draw tribal flames: some fun facts before starting sketching! 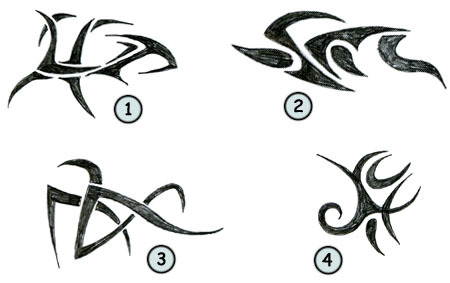 Tribal tattoos were very popular at the end of the 90s. Tattoo removal is still a difficult process. Not all tattoos can be entirely removed by modern technology. 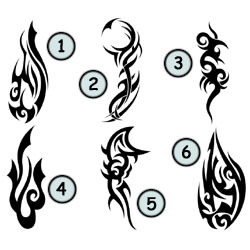 This tutorial will help you learn... how to draw nice tribal flames! You are not designing tattoos, are you? Whether it's the case or not, I find that drawing tribal flames is a good exercise in your process of learning how to draw. There is no rules, no guidelines to follow when designing one of these beautiful pieces of art. You can just do what you want to do... that's the easiest way to learn to draw! By using your imagination! Observing those nicely design shapes, you can notice that the outline doesn't really matter. It's the complexity of the design itself that makes it cool. The way the lines are moving and crossing each others really gives tribal flames a unique texture and visual impact. This example will help you sketch a simple three lines tribal flame! First, start by drawing the outline. Then, sketch the first line and make it look like a big "b". Draw two hooks on the left of the main line and then add another line on the right. This new line should look like a big "c". That's it! Once you feel more comfortable, you can start building more complex designs (1) and start testing new patterns (2). Knowing how to draw simple tribal flames is really not so difficult, but beware that it's not so easy to draw one with a professional and clean look. Enjoy!